When it comes to mobility, Michigan is a global leader in autonomous, connected, electrified, and shared vehicle technology, but can it stay ahead of the pack? Major automakers, suppliers, universities, and Michigan itself are investing billions of dollars in vehicles that drive themselves, talk to each other, operate on electricity, and can be deployed in sophisticated ride- and car-sharing applications. The first three endeavors support the fourth — a transportation system that relies less on personal vehicle ownership and more on the safe, reliable movement of people and goods from point A to point B, with the added benefit of a significant reduction in annual traffic deaths caused by human error. To some critics, southeast Michigan’s century of engineering and manufacturing complex vehicles by the millions brands them “Rust Belt has-beens.” But forget the labels and take note of the reality. Michigan is leading the way as tech-savvy leaders in the automated driving race. While no one discounts the 3-million-mile head start that Google spinoff Waymo has in autonomous car testing, General Motors Co. and Ford Motor Co. topped a recent ranking by Navigant Research of 18 companies pursuing automated driving. Michigan ranks first in the nation with close to 50 connected and automated vehicle projects, and first with 2,583 mobility-related patents covering data processing, vehicle, navigation, relative location, and more, according to a new MICHauto compilation of industry statistics. The Detroit Regional Chamber, which launched MICHauto to promote, grow, and draw automotive and mobility companies and organizations here, says the state is home to more than 2,200 automotive facilities (R&D, design, engineering, and testing). In August, Ford Motor Co. and Domino’s Inc. teamed up to test food deliver in self-driving Ford Fusions in the Ann Arbor area. Cole believes Silicon Valley is reaching the point of becoming a commodity, as the coolness of each new product quickly fades compared with its predecessor. By contrast, car companies and suppliers that turn out millions of vehicles and earn billions of dollars annually are trying to demonstrate they can weather the next downturn in a cyclical industry. In other words, they need each other. In developing the future of transportation, automakers and suppliers are filling their knowledge gaps by acquiring startups and investing in promising, if little-known, companies. GM invested in the business accelerator 500 Startups in Mountain View, Calif., hoping to discover the next big thing while choosing seed-stage companies to mentor. Ford financially backs the Techstars Mobility business accelerator in Detroit, and operates a 25,000-square-foot R&D center at the Stanford Research Park in Palo Alto, Calif. In turn, GM, Ford, FCA US, other OEMs, and a significant number of automotive suppliers operate technical centers, testing labs, and proving grounds in the region where they can test the latest autonomous developments before introducing the technology to the marketplace. GM’s Cadillac division, for example, recently launched its Super Cruise hands-free driving system for highways (available on the 2018 Cadillac CT6). GM and Ford also bet big in acquiring software startups to accelerate their autonomous efforts. 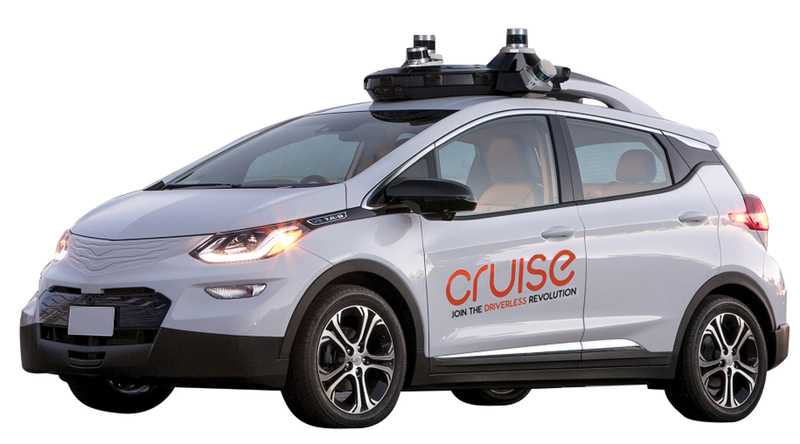 GM in 2016 bought Cruise Automation for $581 million. 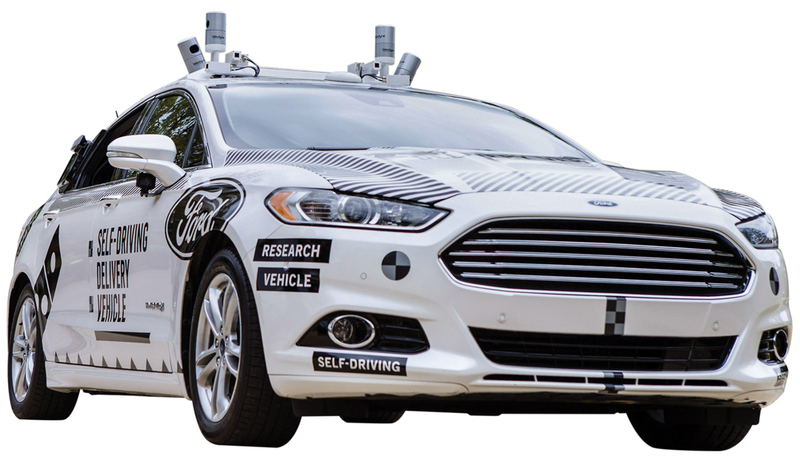 Last February, Ford committed to investing up to $1 billion over five years in Pittsburgh-based artificial intelligence startup Argo AI. Ford also invested $75 million in LIDAR maker Velodyne in 2016, while last October General Motors bought Strobe Inc., pairing its engineers with Cruise Automation to speed the development of high-resolution images that provide more accurate views of the world than cameras or radar alone. GM’s roots in autonomous vehicles date to experiments in the 1950s — captured on long-form video and chuckle-worthy for their dated portrayals of social mores. Its “aha moment” came a half century later. In collaboration with Pittsburgh-based Carnegie Mellon University, in 2007 GM’s fully autonomous BOSS vehicle won the Defense Advanced Research Projects Agency (DARPA) Urban Challenge, navigating a 60-mile course without a human at the wheel. Two leaders of the program, Chris Urmson and Brian Salesky, went on to head up Google’s automated car program. Urmson left in 2016 to start Aurora, and Salesky formed Argo AI, now in Ford’s control. The race intensified In September when GM and Cruise Automation revealed what they described as the world’s first mass-production automated car, based on a Chevrolet Bolt EV. It was their third iteration of an automated Bolt EV in 14 months, and the first with everything on board to drive without a human operator once the software and regulatory environment is ready. Looking ahead to the need to validate its robo-cars, Ford recently committed $5 million to become a founding member — along with AT&T, Toyota, Hyundai R&D, and Visteon Corp. — of the not-for-profit American Center for Mobility, a 500-acre test facility under construction in Ypsilanti Township on the grounds of the former Willow Run bomber plant, better known as the World War II-era Arsenal of Democracy. Like OEM customers, suppliers are going deep in the autonomous and connected space. “Michigan is the hub of automotive, even when designing for Asia and Japan,” says Pat Bassett, vice president of Denso International America North America Research and Engineering Center, which employs 750 engineers in Southfield. The parent company is based in Japan. Google’s Waymo is testing its autonomous technology using Chrysler Pacificas. Operating a large campus near I-275 in Plymouth Township, German-based Robert Bosch GmbH has 2,500 engineers who work on autonomous vehicle systems. Software and hardware engineers there developed a multi-camera system that provides precise views of a vehicle’s surroundings, making parking safer and easier. Autonomous cars, after all, will need to learn to park. Dan Galves, chief communications officer for Israel-based advanced vision-based driving system developer Mobileye, says having a presence in Michigan is a must. “We feel this whole idea of scalability is being lost. If you really want to create a transformation in cost and mass production, that’s the specialty of Michigan,” he says. Delphi, which has its North American headquarters along I-75 in Troy, “is one of the most interesting companies in how they transitioned themselves after bankruptcy,” says Abuelsamid, who points to Delphi’s reorganization into two groups: Aptiv for electrical architecture, automation, software, and services; and Delphi Technologies for its powertrain business. It has positioned the supplier as “one of the strongest players in Michigan in a lot of ways,” he adds. Expanding well beyond its Michigan roots as GM’s one-time vertically integrated parts unit, Delphi joined BMW Group and Mobileye (recently acquired by Intel) to integrate systems in BMW’s autonomous driving platform. It is working with Intel and Mobileye on perception, sensor fusion, and high-performance automated driving computing. “Our close working relationship with all three partners serves as a solid foundation for success,” said Kevin Clark, president and CEO of Delphi, at the time of the announcement in May. 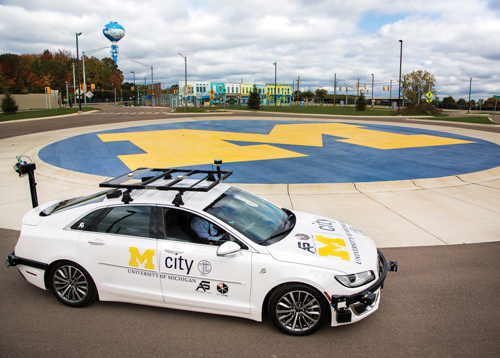 Meanwhile, 70 original equipment manufacturers, suppliers, and companies in the periphery of automotive are part of the University of Michigan’s Mcity driving research facility that spans 32 acres at the North Campus in Ann Arbor. Sixteen of the companies form a Leadership Circle to oversee what Mcity Deputy Director Carrie Morton calls the “ultimate sandbox,” capable of creating any kind of autonomous or connected vehicle scenario without disturbing public roads. On a recent sunny morning, U-M mechanical engineering graduate students Sergei Avedisov and Chaozhe He demonstrated how autonomous and vehicle-to-vehicle communication platforms on a modified 2016 Kia Soul could benefit safety and comfort. First, they instructed a passenger to touch the black button on a game controller between the front seats. The Kia began moving on its own, accelerating to 35 mph. Cresting a hill and rounding a shrub-obscured curve, the Kia slammed on the brakes to avoid a 1996 Honda Accord parked a few dozen feet ahead. On a second run, the Kia accelerated to the same speed. This time, though, the car knew in advance the Honda was ahead because the Accord sent its location via Dedicated Short Range Communication, which is the heart of V2V (vehicle-to-vehicle) communication. Using the intelligence of V2V, the Kia braked at a sixth of the G force of the first run, creating a less stressful experience for passengers and a far safer scenario on wet or icy roads. Morton says V2V and V2I — vehicle-to-vehicle and vehicle-to-infrastructure — communication (via embedded sensors in road signs, traffic lights, and other urban components) will eventually cover most of Ann Arbor to create a body of shared research in human factors, cybersecurity, insurance, and understanding how legal liability will play out in the courts. 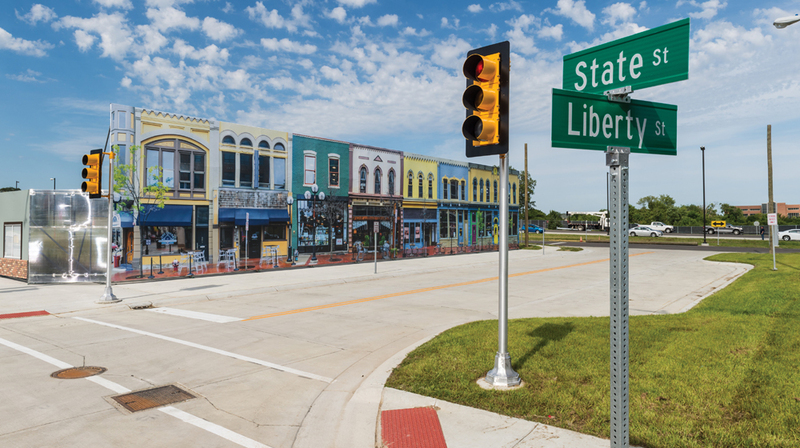 Between Mcity and the America Center for Mobility, where the first phase of testing was set for December, Michigan covers all the technology readiness levels that are needed to enable consistent discussions of technical maturity across different types of technology. Recognized in 2016 by the Intelligent Transportation Society for its connected and automated vehicle efforts, the state invested $3 million in Mcity and has pledged $65 million to the American Center for Mobility. The state also is investing in major infrastructure improvements along U.S. 12 near the American Center for Mobility that will incorporate about 1.5 miles of the westbound divided road into the center’s closed track. Eastbound lanes are being converted to accommodate two-way traffic on U.S. 12. There’s also PlanetM, a state-initiated partnership of mobility organizations, communities, educational institutions, R&D, and government agencies working together to develop and deploy the mobility technologies driving the future. Available to any mobility-focused company or investor, PlanetM is a no-cost, concierge service that connects businesses and executives to Michigan’s automotive ecosystem. Steudle says Gov. Rick Snyder tasked him to harness automated and connected infrastructure technology. Snyder also directed other departments, such as Michigan Economic Development Corp., to help shoulder the financial load. In addition to being a voice in the testing facilities, Steudle oversees 10 to 20 smaller projects, including one with 3M Corp. on I-75 in Oakland County. The 3M project tests machine-vision bar-coding tabs embedded in road signs (V2I). Although data collected in many of these projects is “proprietary” to the investing company, improved road safety benefits everyone. Next articleGuest Blog: Brick & Mortar Retailers – Who's Afraid of the World Wide Web?